At a large gathering marking the 30th anniversary of the repose of Protopresbyter Alexander Schmemann that took place at the “Pokrovskye Vorota” Cultural Center here on Sunday, December 15, 2013 , a newly published collection of Father Alexander’s writings, “The Liturgy of Death in Contemporary Culture,” made its debut. 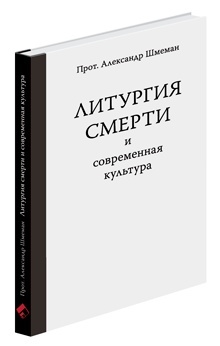 The book was edited and translated into Russian from various lectures by Father Alexander that had not been published previously. Moderating the program was Sergei Chapnin, Editor of the Journal of the Moscow Patriarchate and the Church Messenger newspaper and member of the Inter-Council of the Russian Orthodox Church. Among the many other attendees were Archimandrite Alexander [Pihach], Representative of the Orthodox Church in America to the Moscow Patriarchate and Dean of Saint Catherine the Great Martyr Representation Church, Moscow; Priest Sergei Kruglov; Mikhail Seleznov, Institute of Eastern Cultures and Antiquity, Russian Humanities State University; Giovani Paravinchini, Cultural Attache of the Apostolic Nunciature in the Russian Federation; Andrei Desnitsky, Senior Academic Consultant of the Institute of Eastern Studies, Russian Academy of Sciences; Olga Sedakova, Consultant of the Institute for Bible Translation, poet; Alexnder Kyrlezhev, Academic Consultant of the Synodal Theological Commission of the Russian Orthodox Church; Anna Sonkin-Dorman, Physician in Palliative Medicine; Andrei Borisovich Efimov, Director for the History of Mission, Deputy Dean of the Faculty of Missiology of the Orthodox Saint Tikhon State University; and Elena Dorman, A.S. Solzhenitsyn House of the Russian Zarubezh’e, translator and editor. During the memorial gathering, Archimandrite Alexander read greetings from His Beatitude, Metropolitan Tikhon, Primate of the Orthodox Church in America, the text of which appears below. The greeting was also read at the conclusion of a panikhida for Father Alexander celebrated at Saint Catherine Church on December 13, the 30th anniversary of his repose. “December 13 is the 30th anniversary of the death of Protopresbyter Alexander Schmemann. On this day a panikhida is celebrated at the Church of Saint Catherine the Great Martyr In-the-Fields in Moscow – the Representation of the Orthodox Church in America. On December 15, Father Alexander’s reflections on ‘The Liturgy of Death in Contemporary Culture’ is to be presented to the public here in Moscow. This book is a translation into Russian of lectures in the English language. “Our prayers for the ever-memorable Father Alexander and the publication of yet another part of his theological work are evidence that the memory of Father Alexander is a living memory. “Father Alexander was a man of many dimensions—priest and pastor, theologian and teacher of liturgical theology; lover of Russian, French, and English literature; servant of the Church and her mission in the world; and specifically servant of the Orthodox Church in America and her mission in America. It was characteristic of him that his theological and academic excellence was put at the service of the Church in a dynamic and constructive way. He was a sharp critic of the dead ends of some Orthodox habits of thought, yet never tired of witnessing to the Orthodox faith as an experience of joy and an experience of the truth which makes us free. “Father Alexander delighted in emphasizing that the Gospel begins with joy and ends with joy. The shepherds in the field near Bethlehem hear the words of an angel of the Lord: ‘Behold, I bring you good news of a great joy which will come to all the people; for to you is born this day in the city of David a Savior, Who is Christ the Lord’ [Luke 2: 10-11]. The disciples follow the Lord as far as Bethany. ‘While He blessed them, He parted from them. And they returned to Jerusalem with great joy [Luke 24: 51-52], there to await the power from on high promised by their Lord. “It was in the liturgical life and tradition of the Church that Father Alexander found the source and inspiration of his theological thought and teaching. The Eucharist was at the heart of his experience of the truth and saving power of the Orthodox faith. This insight he shared with his students, inspiring in the Church a ‘Eucharistic renewal’ which lives not only in America, but in many parts of the one Orthodox Church.